The final Collins forest to be certified is the Collins Lakeview Forest. This brings the total number of certified acres to over 311,000. 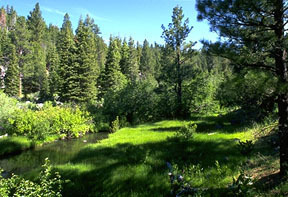 The FSC-certified Collins Lakeview Forest includes over 63,000 acres in Lake and Klamath County, Oregon and 33,789 acres in Modoc County, California. The Oregon acreage is the largest block of forest lands to be certified in the state. It is managed on an uneven-aged, sustained yield basis. Tree species include ponderosa pine, white fir, lodgepole pine, and incense cedar. Past and current timber harvest activities that are not selectively removing necessary habitat for any species of taxa. There is ample evidence across the ownership that silvicultural regimes do not require use of herbicides to secure adequate regeneration. Collins’ presence in the Lakeview regions has been stable and long-term. While its competitors have come and gone, Collins has sustained and now remains the only industrial forest management and processing concern in the region. The company has, through its actions over the long haul, created and maintains a very good reputation within the community. The company has a general policy of open public access to the Collins Lakeview Forest, subject to selective road closures when necessary for public safety and resource protection.